The likely anecdote for winter melancholia is a trip to a warm climate. Miami comes to mind. And when we think of Miami, South Beach has traditionally been the tourist hub. But these days, it's only one of the entrees Miami is serving. The likely antidote for winter melancholia is a trip to a warm climate. Miami comes to mind. And when we think of Miami, South Beach has traditionally been the tourist hub. But these days, it's only one of the entrees Miami is serving. Downtown, Mid Beach, Miami Shores... If you go to Miami, the lush life and hip things to do are everywhere. Views from Viceroy Miami hotel of Biscayne Bay and Key Biscayne. During the recession, when a herd of condos were built and few could find buyers or renters, downtown Miami was like a skyscraper ghost town, where only financial office buildings and business hotels prospered. Post recession, those empty apartments/condos are full; people are walking and jogging up and down the streets. Restaurants attract urban warriors, nightclubs jump and life keeps a beat among glistening buildings, pristine streets and waterways with passing yachts. The 148-room Viceroy Miami is a chic, stylish 50-floor hotel set in the heart of the financial district on Brickell Avenue. The elevator hallway alone portends the boutique luxury to come: checkered floors with diagonal designs, gold-dusted walls and copper colored ceilings, Asian-looking statues with pointy lantern hats. Head upstairs and the rooms face the Miami River where yachts like Mark Cuban's sleep. At The Viceroy, that common area is the FIFTY Ultra Lounge on the rooftop in addition to the sun deck and pool area on the 15th floor. Walk on to the verandah and chairs surround an 80-person hot tub and Florida's longest infinity pool. Catchy energetic music fills the air and a party atmosphere prevails. Keep walking past the first two pools, and you'll see the third ultra long one that is perfect for swimming laps and is less crowded. At the end of that pool there is a quiet deck area and a drop off into a waterway with spectacular views of Biscayne Bay and the island of Key Biscayne. Off the back pool, a door leads to an elevator, which takes you to the Philippe Starck-designed 28,000 integrated square foot Spa at Viceroy Miami. A 2,500-square-foot gym, features trainers, integrated wellness classes, yoga, Pilates and a spinning studio. A 5,000-square-foot white marble water lounge has a floating library, a reflecting pond, hot and cold plunge pools and dramatic floor-to-ceiling windows. Ten spa treatment rooms feature various treatments or packages: Journey for Her includes Viceroy Miami Signature Massage, Viceroy Miami Signature Facial, Classic Manicure, 2.5 hours $285. Journey for Him includes Gentlemen's Massage, Gentlemen's Hot Towel Facial, Gentlemen's Manicure 2.5 hours $285. Prepare to be treated like a king or queen by therapists like Chrissanthi, who prefers a more natural approach to massages, "Massages are like cooking. You throw in a bit of everything (Swedish, Sports, Deep, Thai Stretching) until it feels right." Next to the pool area, the popular restaurant 15 & Vine Kitchen and Bar is a perfect place to sample tapas all night long. Try the Grilled Flatbread (topped with roasted garlic, leek confit, manchego cheese and truffle); go for the main course entrée Thai Style Bouillabaisse (served with lobster tail, mussels and halibut in a lemongrass coconut broth). Desserts include a Guava Sammie with caramel cheesecake, guava jelly and vanilla wafer. Eat inside or outside. The uber-classy Cipriani Downtown Miami is on the first floor of Icon Brickell next to the water with views of boats the size of houses. The swank blue and white nautical interior combined with the striped Venetian flooring and Murano chandeliers make you feel like you are in the captain's room on a very fancy ocean-liner. Cozy up to the delicate Langoustine Scampi Tempura appetizer; the house specialty pasta course is the delicious Baked Green Tagliolini with Praga Ham; for your main course the Veal Chop Milanese is flattened thin as a dollar bill and melts in your mouth. Spoil your sweet tooth with the delicate Vanilla Meringue and add a lump of the homemade Vanilla Ice Cream. This is the best tasting Italian food you will ever have outside of Northern Italy. North of downtown on Biscayne Blvd., the Pérez Art Museum Miami in Museum Park is the haute museum. PAMM is an indoor/outdoor 200,000 square feet concrete wonder dedicated to exhibiting 20th and 21st century international art like the Buckminster Fuller Fly's Eye Dome in the sculpture garden and Mexico City-based artist Mario García Torres' multimedia exhibit. Leave Ocean Drive to the twentysomethings. Lincoln Road attracts a crowd of dense tourists like New York's Times Square. If you want a vacation that's calm, but near the hot spots, Mid Miami Beach fits the bill. Especially, if you stay at the Carillion Hotel and Spa, at Collins Ave and 68th Street. Formerly the Canyon Ranch, this tranquil, health-conscious but lively place is the perfect stress reliever and a cure for winter depression. It sits on a less-traveled section of the beach. Walk into the vast lobby, and the 110-all-suite hotel invites you to relax the minute you step in the door with its soothing tan, brown and wood interior. The one-bedroom suites come with kitchenettes, sleek living rooms, bedrooms and balconies. The bathrooms, with a taupe marble décor are big enough to host a party; a soaking tub and separate shower are a refuge within a refuge. When you head down to the oceanfront Carillon Grill for breakfast lunch or dinner, be aware that everything is fresh, as farm to table as possible, and there is a calorie count on each item on the menu. Mornings, the place to be is on the beach catching the Eastern Sun. There is no noise. Cell phones are verboten; you hear gentle conversations and the water rushing in. No crowds. No loud radios or screaming babies. If you prefer swimming in a pool, a large one sits right by the entrance to the beach. There's another on top of the Spa on the 5th floor for midday sun, and still another on the North Towers verandah for late afternoon sun and sunsets. You can sunbathe all day. Four blocks north and two blocks East, North Shore Park Tennis Center flourishes with players in the middle of intense games, instructors giving adult clinics and teachers coaching children's classes. At sunset pick-up games of soccer abound on the adjacent fields. The same management company runs the courts at Miami Shores Tennis Complex at the Country Club, off Biscayne Blvd on 100th Street, which sits next to the club's golf course. The tennis instructor Liburd "Burd" Germain oversees the six clay courts and three cushioned hard courts. The legendary pro Gibson often teaches lessons and classes. A trip to these courts puts you in an up-and-coming neighborhood that is attracting couples from downtown and South Beach who want to buy an old house, refurbish it and start a family. The Carillion's magnificent, 70,000-square-foot Wellness Spa, the largest in Florida, is a scene-stealer. Lounge in a thermal suite, relax with spa treatments, swim laps on the roof top pool, and take a group fitness class. Adventurers can claw their way up the two-story climbing wall and headsets are provided at the Fitness Center. Exercise Physiologists like Oliver Medina can help you assess your body mass (fat, muscles, bone density), create a fitness and diet plan and regime that you can continue at home. For dinner head to the gourmet Villa Azur Restaurant & Lounge, which is next door to the Markowicz Fine Art Gallery and looks like the insides of a chateau. Homey-looking furniture is meticulously placed. The center room is in a courtyard with a lace-curtain ceiling under a transparent rainproof canopy embellished with white drapes and chandeliers. Feast on the French Mediterranean dishes prepared with an Italian twist. Start dinner with the Octopus with Traditional 'Rouille" Sauce, which is sweet, savory. For pasta the Truffle French Ravioles are flavorful. The Dover sole a la Meuniere is magically filleted at your table. The Lemon Meringue Pie is tart and sweet at the same time. No vacation in Miami could be complete without at least a trip to South Beach. It's easy to get around; everything is within walking distance. Surfcomber Miami South Beach a Kimpton Hotel strikes the perfect balance between fun European bohemian living and quality service and food. The eclectic lobby with surfboards on the walls, eccentric furniture and statues of black sheep underline the playful atmosphere. The 186 cozy rooms are steps away from an expansive pool, an outdoor deck, large cabanas and a walkway with direct access to the beach. The Surfcomber is within walking distance to the Lincoln Road pedestrian mall, shops, restaurants and nightclubs along Collins Avenue and Washington Avenue. Check out the: New World Symphony a music academy/performing arts center for concerts and wall-cast film showings after dark. The Fillmore Miami Beach at Jackie Gleason Theater has upcoming shows featuring Jessie J, Jackson Browne, Shawn Mendes and Ryan Adams. The Miami Beach Convention Center presents the International Boat Show, Miami Fashion Week and the South Florida International Auto Show. To get an up close look at the Miami Port, Fisher Island, Star Island, Downtown Miami, Biscayne Bay and the colorful Stiltsville Houses by boat, take a personalized tour with Ocean Force Adventures. Captain Mack, the tour guide, takes just six passengers aboard his intimate Zodiac RIB during the two-hour trips that focus on historical, cultural and marine life aspects. He's full of stories, trivia and a bit of gossip (ask about Shaquille O'Neal's old house). The Surfcomber's own lobby restaurant The Social Club is a nice place to dine. Sit outside and you can watch throngs of party people parade up Collins Avenue. The Crispy Alligator is such a unique Floridian appetizer you'll call your friends back home to brag about it. The Caribbean Red Snapper (with pico de gallo, chorizo fried rice, black bean puree) is served twisted up like a feather on a church lady's hat. Save room for the Maple Croissant Bread Pudding. Oolite uses gluten-free ingredients and regional flavors in its cuisine. Don't' debate between the Green-Tomato Arepas (crunchy, fried green tomato & romescu Slow roasted duck & goat cheese) and the Wessel's Barbecue Shrimp for appetizers. Eat both. The Creole Roasted Oxtail and the Lechon-Porksour orange & onions (a delicious cube of pork shoulder) top the entrée list. As you drink down the last drop of the Davis Bynum Russian River Chardonnay, look forward to the Florida Key Lime Pie. Venture over to Bodega Taqueria y Tequila on 16th Street, it's the new hot spot that combines Mexican street food and a clandestine bar. The front of the eatery looks like an innocuous storefront. Inside, on the left, is a faux Airstream taco truck façade with large windows where waitresses take orders for: Quesadilla Con Rajas with Mexican Chorizo, Pork, Chicken or Short Rib; Flame Broiled Pork Tacos with Red Onion & Cilantro; and other scrumptious Mexican soul food. By day the place looks like a spotlessly clean café. At night, hordes of hipsters descend like locusts. You'll notice a velvet rope on the right side of the room in front of a door marked "Baños." That portal does not lead to the "bathroom," but a cavernous bar area with couches, a pool table and an elaborate bar filled with enough liquor for ten weddings and ten Quinceañeras. It's your choice: Chasing pavements in the downtown quarter, luxuriating in the peace and quiet of Mid-Miami Beach or becoming a nightcrawler in South Beach. 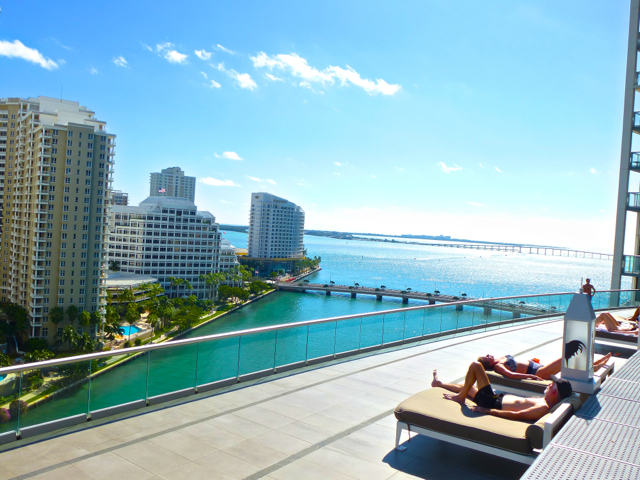 The Lush Life and Hip Things in Miami are a cure for the winter blues.